Institutes: 1Department of Radiology, 2Department of Gastroenterology, 3Department of Paediatric Cardiology, Ghent University Hospital, Ghent, Belgium. Clinical history: A 46 year old woman was referred to our hospital for investigation of vaginal blood loss. Relevant medical history was Behçet’s syndrome, chronic venous insufficiency and deep venous thrombosis in lower extremities, pulmonary embolism, and recent symptomatic iron-deficiency anaemia needing blood transfusion. The patient was not using any drugs, alcohol or medication. During physical examination, patient was found pale but with normal tension and pulsations; some superficial veins in the abdominal skin were noted. Excepting from haemoglobin of 8.1gr/dL, blood tests were normal. Abdominal ultrasound unexpectedly showed splenomegaly, and an enlarged liver with irregular contour, consistent with cirrhosis. The contrast enhanced venous phase of the first CT study showed hepatic parenchymal heterogeneity and scarring as well as lobus caudatus enlargement, consistent with Budd-Chiari (Figure 1). There was only minor ascites and no liver vein thrombosis or outflow obstruction was noted. The inferior vena cava (IVC) was patent. Figure 1. Axial venous phase CT showing an enlarged spleen and liver with irregular contours and contrast enhancement, indicating liver cirrhosis. To further investigate liver vein pressure, a venous catheterisation was performed. Approaches through the left and right femoral vein (Figure 2) and right jugular vein were unsuccessful for contrast filling of the inferior caval vein. It was cautiously decided not to venture into an invisible IVC. Collateral veins were shown. Liver vein pressure could not be measured. Figure 2. Left (left column) and right (right column)femoral vein injection during invasive angiography. No IVC filling is observed. Note that the guidewire in the left femoral (left column) is high up in the IVC. An MR study of the liver showed a Budd-Chiari liver with patent but morphologically abnormal veins (Figure 3). Figure 3.MR Liver depicting irregular hepatic contours and signal intensities (left column), consistent with Budd-Chiari, and morphologically abnormal liver veins (right column). 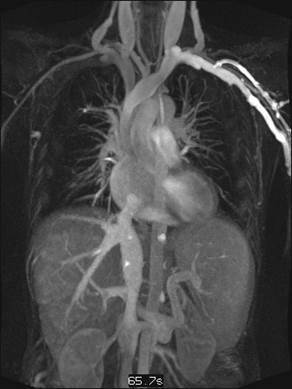 A multiphase contrast enhanced CT study was performed to investigate IVC and liver veins (Figure 4). A homogenous density was found in the IVC of normal size, but passage of contrast appeared delayed. A sharp delineation between IVC blood and intra-atrial blood was present in all phases. Suspicion was raised of an inflow obstruction to the right atrium, and CMR was performed. Figure 4. Multiphase CT Liver: Four phases after contrast bolus injection depict a structure at the venous entry into the right atrium. This structure is sharply delineated from the atrial lumen, and the very homogenous enhancement is delayed compared to atrial filling in arterial (a), portovenous (b), and venous (c) phase, not in equilibrium (d) phase. This finding wassuggestive for lumen instead of thrombus. CMR Findings: A membranous obstruction was found to obstruct inflow of blood from IVC towards right atrium. Cine imaging showed a turbulent jet indicating a small aperture in the membrane, as well as very slow retrograde flow in the IVC, explaining the unsuccessful invasive cavography earlier (Movie 1). This aberrant flow was confirmed by phase contrast images (not shown) and dynamic MR angiography (Figure 5). Movie 1. Long axis cine of the right heart, showing (the right ventricle, right atrium and) both superior and inferior caval venous inflow into the right atrium. The membrane covering the inferior caval venous entry is clearly depicted, with a turbulent jet from blood flow through a small orifice pointing upwards. In the IVC there is slow retrograde flow. There is no evidence for mass or thrombus. Figure 5. Hepatic venous phase of dynamic MRA, coronal view, shows retrograde filling and sharp delineation of IVC contrast and contrast in right atrium. This obstruction was relieved by balloon plasty. Gynecologic surgery was safely performed within two weeks, with normal liver function. Conclusion: We report a very rare congenital heart defect causing a Budd-Chiari phenomenon discovered incidentally in adulthood. Once the suspicion was raised, CMR proved to be an excellent imaging modality for this congenital defect. Perspective: Budd-Chiari is caused by occlusion or slow outflow of liver veins (1). Usually this is the result of a thrombotic process. Behçet’s disease is the cause of 5% of Budd-Chiari, and 2.6% of Behçet patients have liver vein thrombosis. The differential diagnosis in this patient could be membranous Eustachian valve (2, 3), cor triatriatum, membranous obstruction of Vena Cava (MOVC), or a form of caval vein atresia. In case of cor triatriatum the membrane would be located further into the atrium. In MOVC or caval vein atresia we would expect the membrane outside of the heart. Therefore, our diagnosis was Eustachian valve variant. The Eustachian valve is a structure at the junction of IVC and right atrium that during fetal life directs blood toward the foramen ovale. Normally only a rim at the anterolateral aspect of caval vein entry into the atrium remains. MR images of a membrane virtually spanning the complete entrance of the right atrium from the IVC have not yet been published in an adult patient. It is remarkable that this patient has suffered from pulmonary embolism; with the flow reversal in the IVC, thrombus from deep venous thrombosis cannot have reached the heart. Presumably, the patient’s Behçet’s disease combined with slow flow in the IVC or in collateral veins caused the emboli. The patient’s chronic venous deficiency in the lower extremities will have been largely due to this flow obstruction. 1. Aydinli M, Bayraktar Y. Budd-Chiari syndrome: Etiology, pathogenesis and diagnosis. World J Gastroenterol. 2007;13(19):2693-2696. 2. Rossall RE, Caldwell RA. Obstruction of inferior vena cava by a persistent eustachian valve in a young adult. J Clin Pathol. 1957 Feb;10(1):40-5. 3. Kilman JW, Williams TE Jr, Kakos GS, Molnar W, Ryan JM. Budd-Chiari syndrome due to congenital obstruction of the Eustachian valve of the inferior vena cava. Thorac Cardiovasc Surg. 1971 Aug;62(2):226-30.